When you delete emails in outlook/hotmail webmail, those go to Deleted folder (Deleted folder is like recycle bin of your computer) but messages in Deleted folder keeps getting cleaned from time to time. Further, to permanently remove a particular message, you can clean the Deleted folder manually. But suppose, you’ve permanently removed a particular email which you now urge to have it back. On our computer if we delete a file permanently, we need to use data recovery softwares to attempt recovery of files. But what about our emails online? How to recover deleted messages in Outlook? How to disable deleted emails recovery option in Outlook ? Check properly if you deleted mails are still in Deleted folder. If not, at the bottom of the Deleted folder, there is a link to recover deleted messages. Just hit the link. Outlook will try to recover as many messages as it can. Note: Not all messages could be recovered sometimes, so if you don’t get your particular mail, time to cry.. If you found your desired message back, select it and move it back to inbox or another safe folder. This feature is just great because we do wish sometimes to restore certain messages that we deleted in the first instance but later regretted on our decision. Now, some people don’t want to keep any trace of their deleted emails. So, here is how you can disable deleted messages recovery feature in Outlook. 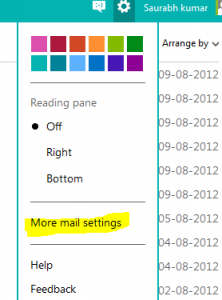 Sign in outlook.com and then go to settings – Select more mail settings. 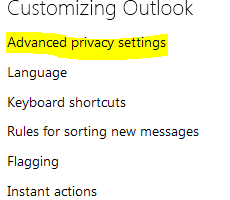 Now under Customizing Outlook section, Choose Advanced Privacy Settings. Under Deleted Messages section, select the radio button labelled Don’t let me recover deleted messages. Hit on Save button. Done! To ensure it is correctly set. Just navigate to deleted folder and you won’t find any link to recover deleted mails there. This will ensure complete privacy. In outlook, we have life-saver option with deleted mails recovery feature but do we have something similar in Gmail? Well, we don’t have the recovery feature like outlook but we can recover our mails from trash folder (=recycle bin of gmail) within 30 days of deletion. In the left sidebar, Hit Trash option. Browse through all the deleted mails. Select the one you want to recover. Click on the folder like icon on the top and move to the desired safe location like inbox or any other custom labels. 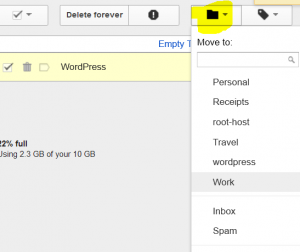 This way, you can reccover your deleted messages in gmail within 30 days. But once deleted from Trash folder either automatically or manually, there is no way to recover such messages then. Of course, there is exception in case if your gmail account was hacked or compromised by someone else and if that person has deleted all your important emails permanently. 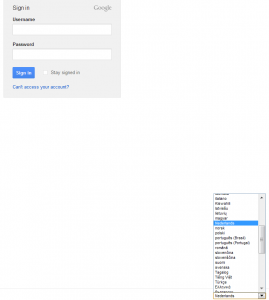 In such case, you have to file a report to gmail support team by following this link . The report will be analyzed by the support team and they might help you with restoring your mails in gmail back if possible.